Meow meow mew meow meow mrrr aow aow meow mew meow meow aow meow mew meow aow mrrr! Happy Valentine’s Day to all the kind Undina’s friends whose compliments to my fluffiness and good nature keep tasty treats coming my way! This entry was posted in "Four legs good", A Postcard from Undina. Bookmark the permalink. Happy Valentine’s Day Rusty and Undina! Thank you, Ferris! Happy Valentine’s to you too! Hi Anna! It’s nice to see you here. As far as I remember Rusty made a mess with flowers just once – when he tried to get one tulip out of the vase. On all other occasions he was very gracious. Happy Valentines Day right back at you! That Rusty – too cute for words! Thank you, Steve! Rusty will get his extra treat. This is The Hairy German. Woof, wwwwooof, garrrrl, arrrl, meurrmh, Woof, kharrrllleh, GARRL, woowooo. Happy Valentine’s Day to you and Rusty! Hope you,had a wonderful day filled with chocolate, perfume, and catnip. You know, somehow Rusty doesn’t respond to catnip. But otherwise we both enjoyed thisday. 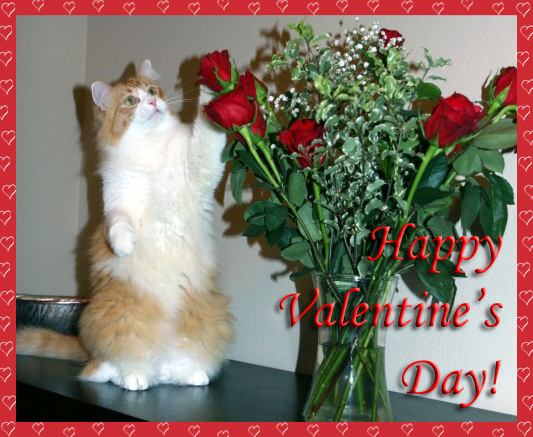 Rusty, swattin’ the roses … makin’ some copies! I watch SNL from time to time as well as “best of”. Awww… Rusty gets not only an extra treat but also a vitamin that for some strange reason he likes even more than treats (what are they putting in those?!). Thank you, Birgit! Undina, hope you had a good day too! Is the book “A Street Cat Named Bob” known in the US? Like Rusty, Bob is a very special cat. Thank you, Tara (from Rusty as well). More pictures are coming soon. Rusty you are adorable…hope you got plenty of treats :) !!! Meow Meow Meow Meow Meow, Meow Meow Meow Meow, Meow Meow, Meow? I mean Hi Rusty, you ginger fluffy perfume lover, I wanna give you a hug, can I? Darn, I should have put some kitty treats inside the perfume package for you, Rusty would be my friend ever since then. give him a big hug in my behalf. Great! How are you doing? Did you do something special on your birthday? great, then I’m patiently waiting for it! HAPPY VALENTINES DAY! Sorry it’s late. Also, Undina, I hope your day was wonderful and filled with lovely scents and kitty hijinks! Thank you, Heather! The day was good for both of us. I have to do my part to keep Rusty in treats. :) He is so handsome! Happy Valentine’s belatedly to you both. Oh, soooo sweet! A belated Happy Valentine’s to you both.